Commuting up the hill from the World Relief office every Monday through Thursday, eager students attended their five-hour English class at Hillside Church. Last summer, World Relief received a state-funded grant to hold a six-month intensive English class in addition to our regularly-scheduled classes. This pilot program was designed to increase the speed of English-level gains by providing five hours instead of three hours of class daily. In early fall, gracious community partners opened up their doors to host our intensive English class, we selected an energetic instructor to teach the class, we invited a variety of English level 1 and 2 students to participate in this unique opportunity, and volunteers came to practice English and build relationships with our students. As weeks and months passed, the class blossomed from a group of individual students from different language backgrounds to a community of learners who constantly challenged, encouraged, and supported each other. In March the pilot came to an end. The students transitioned back to regular, three-hour English classes at World Relief and said goodbye to the community they had built over six months of daily, intensive study together. As funding allows, we hope to be able to offer a similar model in the future. In the meantime, we get to celebrate all English-language levels gains from this intensive English class and our regular English classes. Want to be a part of this community? 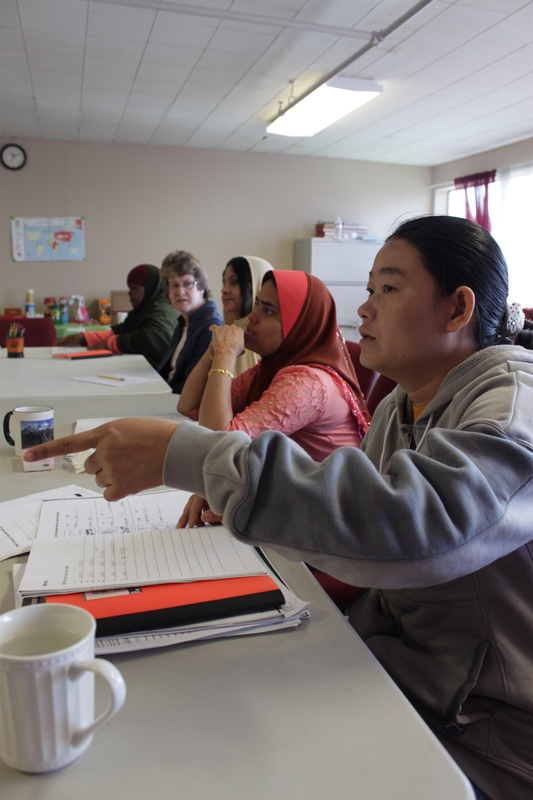 We are always looking for volunteers in our ESL classes to practice English and build relationships with our newly-arrived refugee friends! Visit http://worldreliefseattle.org/volunteer to learn how you can get involved in empowering the lives of refugees here Washington. This entry was posted in ESL on July 29, 2015 by World Relief Seattle. The following is a reflection of Michael, who participated in a 9 month program through The Union Gospel Mission’s Serve Seattle program as a classroom assistant at World Relief. 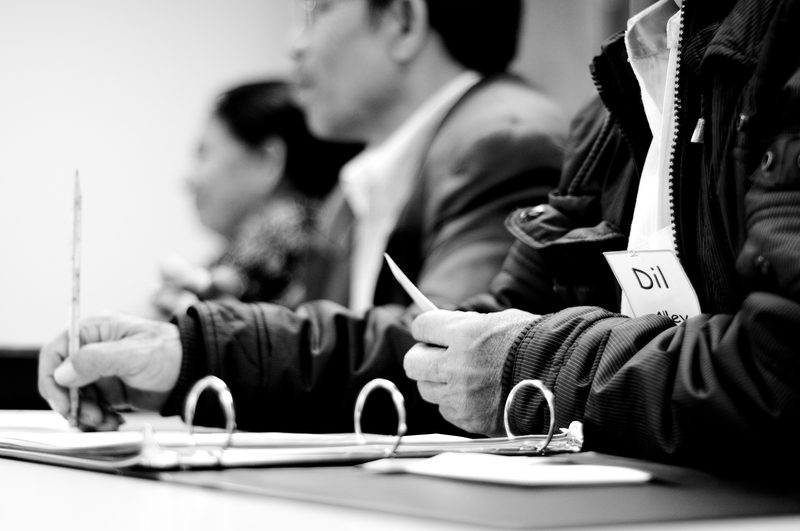 When I first started at World Relief it was very daunting to have so many people who spoke very little English and spoke languages that I knew very little about. I came into this internship thinking that I would be helping all these refugees learn English and other life and job skills. But I was surprised when I realized that I was also learning a lot from these people. It has been amazing to get to see the progress that they have made in their English speaking and reading skills. To a native English speaker it may not seem like much, but I know that going from learning letters and numbers and basic words to being able to speak and write complete sentences in English is a huge accomplishment. Some of my favorite memories have been taking the students on bus trips to Goodwill. Being able to interact with them outside of the classroom has been very impactful for me. Just being able to talk with them and helping them on their English skills makes me proud of them. The most rewarding aspect has really been the relationships that I have developed with both the students and the staff here. Arriving at the classroom each day that I am here, I am always greeted by several of the students, all who know me by name now. Now arriving at the end of my time here, and the start of a new adventure I can look back and say that helping people from so many different countries and cultures learn English (among so many other things) has been an experience that I will never forget. 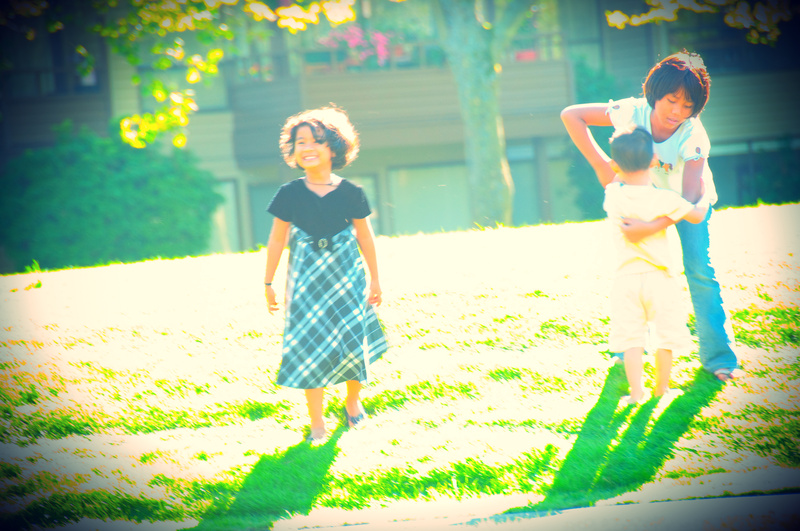 This entry was posted in ESL, Reflections, Uncategorized, Volunteer on August 11, 2014 by World Relief Seattle. Farzaneh: We are learning together. I walked into English class one morning and was surprised to see Farzaneh leaning over a desk, explaining a worksheet to some of her classmates who had very little English skills. Farzaneh had started working in a full-time job the week before. Usually when our clients find employment, they do not have time to continue coming to English class or they begin attending English class in the evening at a local community college. Her job was going just fine. She was in class because not only does she want to keep studying English, she also enjoys the opportunity to learn about different cultures and languages and help more newly-arrived refugees to learn English. 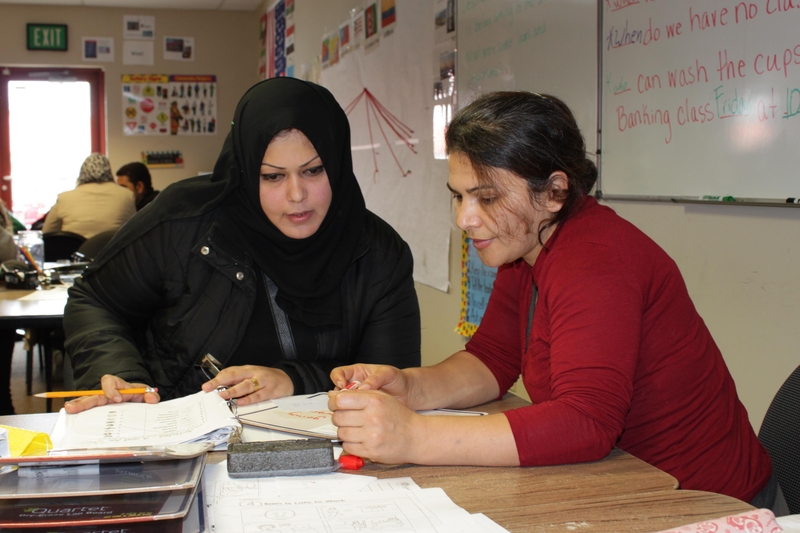 Farzaneh (right) got a full-time job, but returns to English class to help others. “We are learning together”, she says. 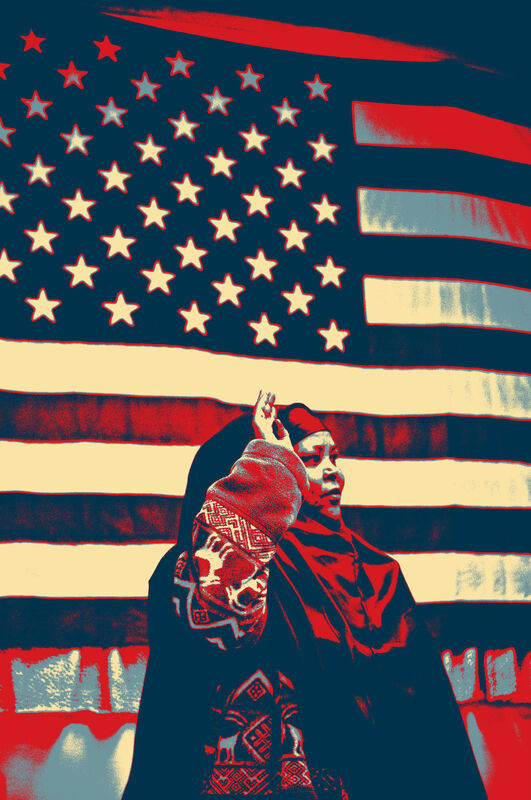 When she first came to the United States in 2010, Farzaneh did not speak much English at all. While she rapidly improved her English by going to the library every day and reading children’s books, her first year in America was difficult. She hated living in America and usually stayed at home. Today, she’s a mom, wife, and full-time employee. She’s learning English and navigating new systems. And, as if that weren’t enough, she makes time to come and help out more newly-arrived refugees who are learning English. One-on-one and small group assistance makes a world of difference for those learning a new language—click here to learn about how you can volunteer as an ESL tutor or class assistant. This entry was posted in Client Spotlight, ESL, Volunteer on January 21, 2014 by World Relief Seattle. World Relief Seattle envisions refugees and immigrants transformed economically, socially, and spiritually. The impact of our work is the result of the hard work of World Relief staff and volunteers, the generosity and prayers of local supporters, and the resilience and strength of the refugees and immigrants with whom we work. These figures represent 12 months of life-changing activity at World Relief Seattle. While there are a lot of numbers here, the most important number is 1. Each life transformed and each individual empowered by the community is cause for celebration. This entry was posted in Current Events, ESL, Refugee Employment, Seattle, Uncategorized, Volunteer on September 19, 2013 by Scott Ellis. In the middle of class one day, one of the English classroom volunteers spontaneously said, “I want to know what the students’ favorite and least favorite things about America are.” So I told her to pose the question to the class for a discussion. The answers were insightful. Most students spoke about how they love freedom in the U.S. and how they feel their families are safe here. Some mentioned their concerns about homelessness, drugs, and alcoholism, which they didn’t expect to find in the United States. One very sweet, shy student became animated as she explained her favorite thing: squirrels! During the hustle and bustle of managing the activity, I initially thought, “Oh that’s wonderful – she likes reading English! It’s even her favorite thing about being here.” But, as I thought about her response later in the day, I recalled that she never learned to read or write in her first language, Nepali. This class at World Relief was her first experience with literacy at all. 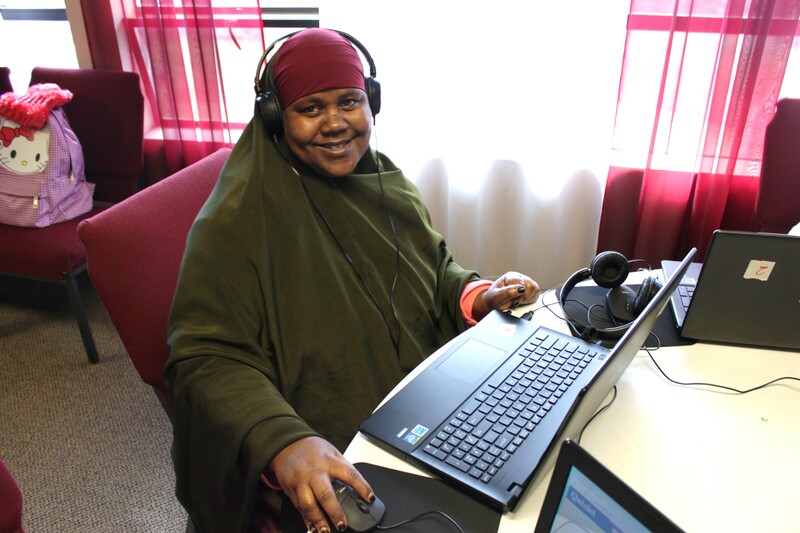 Additionally, out of all of the things she could have been grateful for as a recently arrived refugee, she immediately identified her new-found ability to read and write as most important. Her confidence in these skills empowered her to share her voice in a situation where she would normally be silent, and I think that that is so very cool. 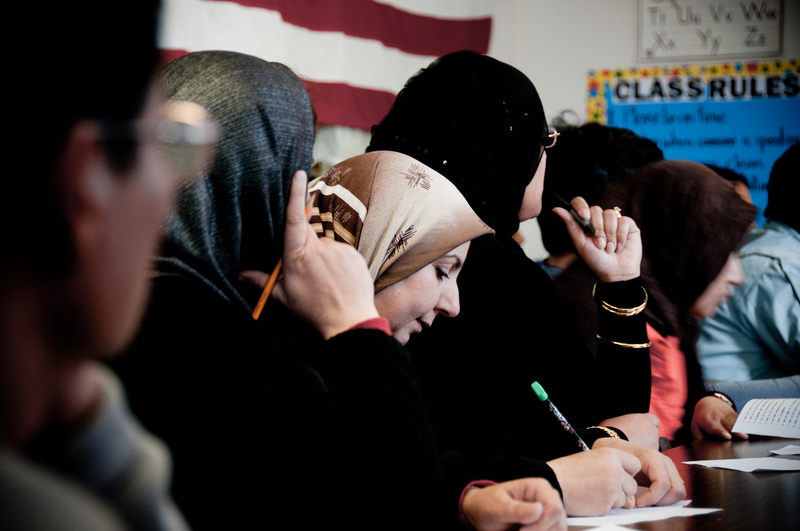 English language learning is a significant challenge for many refugees arriving in the United States. 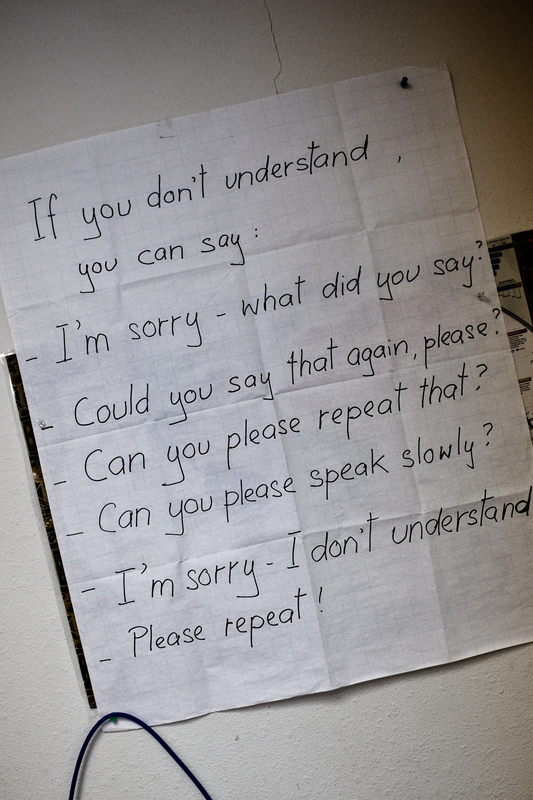 Though most have some past experience with English – however little (“hello”, “thank you”, “no problem” etc.) – students’ levels of skill vary dramatically from those who are non-literate to those who used to work as interpreters or translators. As an instructor, I admit I found this multi-level nature of the classroom at times quite frustrating, but it also turned out to be an opportunity for getting students to interact with each other and with volunteers. In fact, volunteers played a vital role day-to-day by focusing with smaller groups of students on activities and, often, by simply time giving them time to practice spoken English skills in a very low-pressure environment. Students would regularly ask after their favorite volunteers on days when they weren’t around and vice versa! I’m grateful for the volunteer’s question that day and how it made me think twice about what a student really meant. This story was written by Caitlin Wasley, one of our former ESL Instructors through the Americorps Literacy Program (RIP). Caitlin recently graduated from the University of Washington with an MA in Comparative Religion. She is an avid Molly Moon’s fan, and enjoys spotting Corgis in her spare time. World Relief misses you, Caitlin! This entry was posted in Culture, ESL, Reflections on September 17, 2013 by sjohnson.